Welcome Back!! We are so pleased to have our students Back in the Buildings! 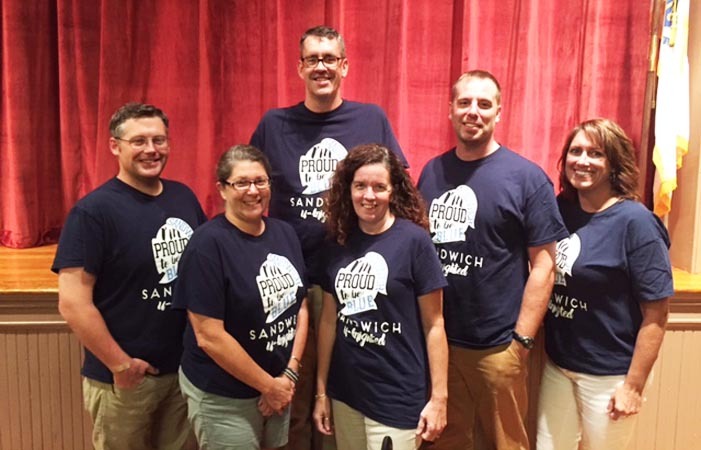 The School Committee met for our first meeting of the new school year on Wednesday, September 9th and we were proud to represent Sandwich U-Knighted by wearing our own shirts, courtesy of Dr. Gould. Be sure to keep an eye out for opportunities to have your students wear their U-Knighted shirts this year for special spirit days throughout the year too! *Goals, Goals & more Goals!! In our workshop and our regular meeting, we discussed our progress on last year’s goals, and the 2017-2018 goals for both the SC and Dr. Gould. You will see how our FANTASTIC District Improvement Strategy plan guides all goals in the district… from the SC and Dr. Gould to the principals and teachers. This plan was introduced over the summer and created by a dedicated, collaborative group with representatives of every part of our whole community. The official goals for both SC and Dr. Gould will be on the agenda for our next meeting on 9/20/17 and be available on our district website shortly after. *Do you know a Sandwich student who is giving back to his/her community? We want to know! Our students do a lot for our community and beyond and we’d like to support and commend their efforts… please email pgould@sandwich.k12.ma.us, mwiklund@sandwich.k12.ma.us and/or shall@sandwich.k12.ma.us and we will recognize them! *Oak Ridge School Improvement Plan update – did you know that each of our schools has a School Council? This group is responsible for assisting the building administrator with the creation and support of a school improvement plan each year – Do you want to get involved?? We would love your help… please contact your building principal if you’re interested! *Coming up on 9/20/17 and Beyond: We will finalize goals, get an early update on how the FY18 budget is progressing, hear from Dr. Gould on 9/20/17 and more! In October, tune in to hear about a very important component in K-12 education called Social & Emotional Learning and how our administrators and teachers incorporate best practices into each aspect of our students’ learning experience.